Branford is a shoreline town located on Long Island Sound in New Haven County, Connecticut, 8 miles (13 km) east of New Haven. The population was 28,026 at the 2010 census. Zwolle is a city and municipality in the northeastern Netherlands serving as Overijssel's capital. With a population of 125,806, it is the second-largest municipality of the province after Enschede. De Bilt is a municipality and a town in the Netherlands, in the province of Utrecht. De Bilt had a population of 42,815 in 2017 and is the seat of the headquarters of the Royal Dutch Meteorological Institute, KNMI. Herzogenbusch concentration camp was a Nazi concentration camp located in Vught near the city of 's-Hertogenbosch, Netherlands. Herzogenbusch was, with Natzweiler-Struthof in occupied France, the only concentration camp run directly by the SS in western Europe outside Germany. The camp was first used in 1943 and held 31,000 prisoners. 749 prisoners died in the camp, and the others were transferred to other camps shortly before the camp was liberated by the Allied Forces in 1944. After the war the camp was used as a prison for Germans and Dutch collaborators. Today there is a visitors' center with exhibitions and a national monument remembering the camp and its victims. The camp is now a museum. Sonderkommandos were work units made up of German Nazi death camp prisoners. They were composed of prisoners, usually Jews, who were forced, on threat of their own deaths, to aid with the disposal of gas chamber victims during the Holocaust. 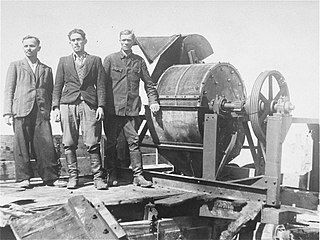 The death-camp Sonderkommandos, who were always inmates, were unrelated to the SS-Sonderkommandos which were ad hoc units formed from various SS offices between 1938 and 1945. Brudzew is a village in the administrative district of Gmina Błaszki, within Sieradz County, Łódź Voivodeship, in central Poland. It lies approximately 7 kilometres (4 mi) south-east of Błaszki, 17 km (11 mi) west of Sieradz, and 69 km (43 mi) west of the regional capital Łódź. A hayloft is a space above a barn, stable or cow-shed, traditionally used for storage of hay or other fodder for the animals below. Haylofts were used mainly before the widespread use of very large hay bales, which allow simpler handling of bulk hay. Poland, officially the Republic of Poland, is a country located in Central Europe. It is divided into 16 administrative subdivisions, covering an area of 312,696 square kilometres (120,733 sq mi), and has a largely temperate seasonal climate. With a population of approximately 38.5 million people, Poland is the sixth most populous member state of the European Union. Poland's capital and largest metropolis is Warsaw. Other major cities include Kraków, Łódź, Wrocław, Poznań, Gdańsk, and Szczecin. 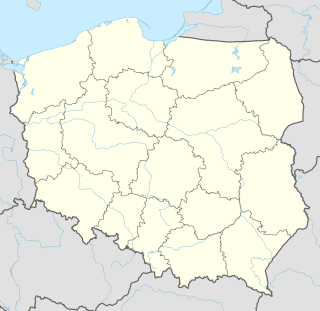 Chełm is a city in eastern Poland with 63,949 inhabitants (2015). It is located to the south-east of Lublin, north of Zamość and south of Biała Podlaska, some 25 kilometres from the border with Ukraine. Chełm used to be the capital of the Chełm Voivodeship until it became part of the Lublin Voivodeship in 1999. Parczew County is a unit of territorial administration and local government (powiat) in Lublin Voivodeship, eastern Poland. It was established on January 1, 1999, as a result of the Polish local government reforms passed in 1998. Its administrative seat and only town is Parczew, which lies 48 kilometres (30 mi) north-east of the regional capital Lublin. Sobibór was a Nazi German extermination camp built and operated by the SS during World War II near the railway station of Sobibór near Włodawa within the semi-colonial territory of General Government of the occupied Second Polish Republic. Escape from Sobibor is a 1987 British television film which aired on CBS. It is the story of the mass escape from the extermination camp at Sobibor, the most successful uprising by Jewish prisoners of German extermination camps. The film was directed by Jack Gold and shot in Avala, Yugoslavia. Helga Deen was a diarist whose diary was discovered in 2004, which describes her stay in a Dutch prison camp, Kamp Vught, where she was brought during World War II at the age of 18. Anna Maria (Settela) Steinbach was a Dutch girl who was gassed in Nazi Germany's Auschwitz-Birkenau extermination camp. Initially identified as a Dutch Jew, her personal identity and association with the Sinti group of the Romani people were discovered in 1994. Elka de Levie was an Amsterdam-born Dutch gymnast who won the gold medal as member of the Dutch gymnastics team at the 1928 Summer Olympics in Amsterdam. 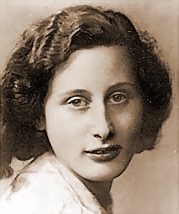 She was the only Jewish team member to survive the Holocaust; her teammates Anna Dresden-Polak, Jud Simons and Helena Nordheim and coach Gerrit Kleerekoper were gassed in Sobibor, while Estella Agsteribbe was gassed in Auschwitz. Helena "Lea" Nordheim was a Jewish-Dutch gymnast. She won the gold medal as a member of the Dutch gymnastics team at the 1928 Summer Olympics in her native Amsterdam. Anna "Ans" Dresden-Polak was a Jewish Dutch gymnast. Judikje "Jud" Simons was a Dutch gymnast who competed in the 1928 Summer Olympics. Gerrit Kleerekoper was a Jewish - Dutch gymnastics coach. He was married with two children and worked as a diamond cutter. Ad van Liempt is a Dutch journalist, writer and a TV producer. He has written several books, including a biography of Prince Bernhard. He also initiated the history program Andere Tijden. Henri Anthony Melchior Tieleman (Hans) Kolfschoten was a Dutch politician of the Roman Catholic State Party (RKSP) and its successor the Catholic People's Party (KVP). Bloeme Evers-Emden was a Dutch Jewish teacher and child psychologist who extensively researched the phenomenon of "hidden children" during World War II and wrote four books on the subject in the 1990s. Her interest in the topic grew out of her own experiences during World War II, when she was forced to go into hiding from the Nazis and was subsequently arrested and deported to Auschwitz on the last transport leaving the Westerbork transit camp on 3 September 1944. Together with her on the train were Anne Frank and her family, whom she had known in Amsterdam. She was liberated on 8 May 1945. Juan Luria was a Polish-Jewish operatic baritone. Born as Johannes Lorié, he studied with Joseph Gänsbacher in Vienna. Jules Schelvis was a Dutch historian, writer, Holocaust survivor, and Nazi hunter. He lost his wife and most of his family during The Holocaust. Schelvis was a plaintiff and expert witness during the trial of John Demjanjuk. Walter Süskind was a German Jew who helped about 600 Jewish children escape the Holocaust. He was a member of the Dutch Jewish council during the Second World War. Max van Dam was a Dutch artist born in Winterswijk. He died in the Sobibor extermination camp. 1 2 Holocaust Encyclopedia. "Selma Wijnberg". Profile. United States Holocaust Memorial Museum. Retrieved 25 May 2016. 1 2 Liempt 2010, p. 120-21. ↑ Liempt 2010, p. 13. 1 2 3 4 5 "Saartje (Selma) Engel nee Wijnberg". Holocaust Research Project. Retrieved 4 December 2018. 1 2 3 4 5 De Ree Archiefsystemen. 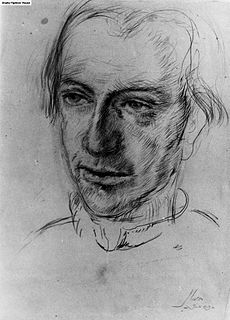 "Chaim Engel". Sobibor Interviews. Netherlands Institute for War Documentation (NIOD). 1 2 3 4 "Selma Wijnberg was de laatste Nederlandse overlevende van Sobibór". Trouw (in Dutch). 4 December 2015. Retrieved 5 December 2018. 1 2 3 4 5 "Holocaust survivor from Branford tells of love amid horror (video)". New Haven Register. Retrieved 4 December 2018. ↑ Liempt 2010, p. 104. ↑ Liempt 2010, p. 113. 1 2 "Chaim Engel, 87, a Sobibor Escapee, Dies". The New York Times . Retrieved 4 December 2018. ↑ Liempt 2010, p. 118. ↑ Liempt 2010, p. 119. 1 2 "Last Dutch Sobibór survivor (96) died". Teller Report. Retrieved 4 December 2018. 1 2 "Dutch American death camp survivor receives apology and knighthood". Godutch. Retrieved 4 December 2018. ↑ Officiële excuses voor Sobibor-overlevende, nos.nl, 8 April 2010. ↑ "Dutch death camp survivor knighted". rnw.org. ↑ "Selma Wijnberg: de vrouw die Sobibor overleefde". Drentheindeoorlog. Retrieved 4 December 2018. ↑ Selma: De vrouw die Sobibor overleefde, Uitzendinggemist.nl, 11 April 2010. Liempt, Ad Van (2010). Selma, de vrouw die Sobibor overleefde (in Dutch). Laren, The Netherlands: Verbum. pp. 13, 104, 118–19, 120–21. ISBN 9789074274425 . Retrieved 16 March 2015.